Carrots & Beets, Beets & Carrots: Evergreen students expand their palates. Flavor Day Fridays Food Tasting events are intended to offer all of our students an opportunity to try new food flavors and textures. Today's event starred two root vegetables, one that most kids love (carrots) and one that is a new or often, begrudged, vegetable (beets). Smothered in olive oil, red wine vinegar, and olive oil, sprinkled with sea salt and rosemary, then roasted...these two become something savory and wonderful. Kids throughout the school tried this roasted root vegetable dish and learned respectful ways of responding to a new food, or one that they think they "don't like". Kindergarten uses the "Thumbs Up, Thumbs Down" protocol to respond to questions about the tasting experience. We'd like to share a special thank you to the following farmers, businesses and parent volunteers who actively support edible education at Evergreen. Without their enthusiasm and hard work, we couldn't do what we do as well as we do it! Matt at Second Spring Market Garden for selling us a whole bunch of amazing carrots with hardly any notice. 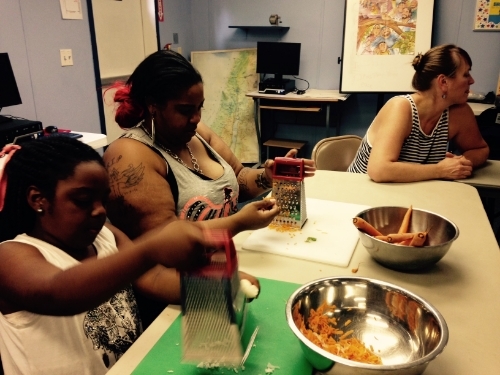 ASAP and the Growing Minds Cooking Stipend grant program for funding this cooking project. Mother Earth Produce for donating the beets. EarthFare grocery store for donating tasting cups for our food tasting events. Parent Volunteers: Molly Pritchard, Allie Schantz, Rosetta Starshine, and Melanie Derry for preparing the recipe at home. Why do we do food tasting in school? ...in case you are wondering, check out this great Op Ed piece from the NY Times about the far reaching positive effects that regular “food tasting” experiences can have in the lives of our students. Field to Feast: Chop it, Cook it, Wrap it! 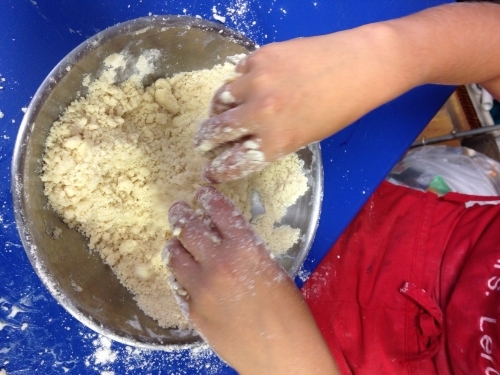 In this trimester's Field to Feast after school club, our theme is Chop it, Cook it, Wrap it! Students will be learning various chopping and cooking skills and preparing healthy dishes all within the theme of "wraps". Just think about it...there are SO many things that are fun to eat that are wrapped up: sushi, enchiladas (with made from scratch tortillas, of course), egg rolls, crepes, hand pies, and so much more! 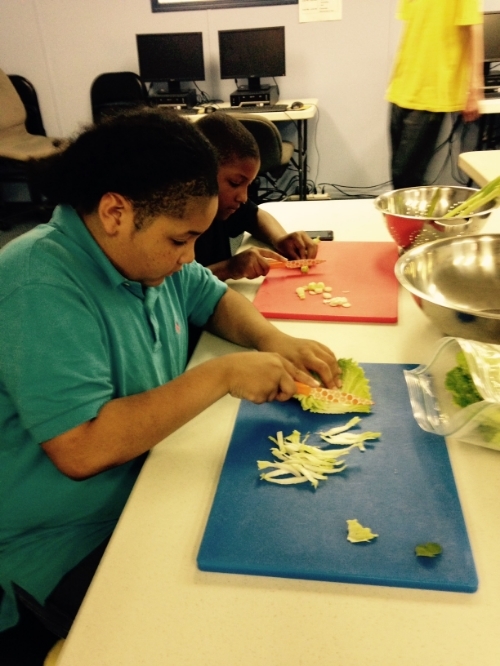 This week we learned how to cut our vegetables into "matchsticks" to prepare the filling for Thai Noodle Lettuce Wraps. This takes a lot of knife control and caution and the kiddos did amazingly well. Kids piled their lettuce wraps high with fillings and smothered them with peanut sauce. Delicious! For more information about Evergreen's Field to Feast afterschool clubs, go to the Evergreen Everafter Clubs & Sports webpage. Remember, Evergreen's afterschool clubs are open to the public! Field to Feast engages students with holistic process of growing, harvesting, preparing and eating food. We work in Evergreen's garden to learn basic gardening skills as well as in our kitchen classroom, where we explore ways to prepare, then eat, what we harvest. In addition to working in and using ingredients from our own garden, we expose the students to what is grown locally on a more regional scale. Through our partnership with FEAST (Fresh Easy Affordable Sustainable Tasty), we are able to supplement with ingredients from local farms on a regular basis, emphasizing the importance of connecting to and supporting our local farms and farmers. The Field to Feast curriculum is a part of Evergreen's Environmental Education programming that focuses on connecting youth with food at its source, to understand its journey to our plates and, most importantly, to learn to appreciate good food and have the skills to choose and prepare foods to feed themselves in healthy ways. With support from the James G.K. McClure Education and Development fund, Evergreen is able to continue to teach the Field to Feast curriculum throughout the 2014-15 school year. Thank you for your support! In Week 2, the Roots and Shoots class will be focusing on useful plants found in nature in addition to the ones we grow and use from the garden. Day 1: We began the week with a guided hike led by special guest, Alan Muskat. I can learn about wild plants and how to harvest them. Alan gave each student a basket and led us in to the woods. Found Touch Me Not, a useful plant for helping heal poison ivy rashes. And various other plants that stuck to our clothes or had funny red bumps, smelled interesting or just looked or felt neat. We learned to thank the plants before harvesting them and how to gauge how much of a plant it is okay to harvest when you are foraging. We found the sought after birch trees at the very end of our hike and collected branches to bring back to school. We will processes the twigs and make birch beer later this week. Thank you Alan for sharing your knowledge and good humor with us! And, many thanks to The Brunk family for allowing us to use their property as our outdoor classroom today. Day 2: Today we continued our botany lab series from last week with special guest teacher, Carlisle Rankin. I can use the tools of science to better understand plants and how they grow. The focus of today's lab was to learn how to use dissection and compound microscopes to observe the STOMATA on plant leaves. Students collected leaves, used dissection tools to create microscope slides, and learned to use our microscopes to observe at various magnifications. Students practiced careful observation techniques to draw what they observed. In addition, we started some mid-season seeds in the garden: carrots, heat-tolerant lettuce varieties, and some summer squash. We'll see how these mid-season plants do with all of this heat! I can work together with my community to grow healthy food to eat. Gadiel prepares the soil in our new straw bale raised bed. Look what Leif and Winslow found while the rest of the crew was planting seeds. Wow! Day 3: Today was the day the students couldn't WAIT for...the day when we brewed up our soda concoctions. We made three soda syrups today: birch, sassafras (root beer), and cucumber-basil-mint. Making Birch Syrup: The making of birch syrup began on Monday with Alan when we collected birch twigs at The Brunk's property. Students cut them into small pieces, rinsed them with water and used butter knives to gently scrape the bark, to loosen the cambium beneath and release the sugars from the twigs. We boiled the twigs in water and ended up with a lovely Birch tea, which, of course, we sampled. Then, we added sugar and cooked it down some more to make a nicely Birch flavored simple syrup. Delicious! The Sassafras syrup was a concoction made from super-locally harvested sassafras- the woods right behind our classroom! We identified the cluster of sassafras trees yesterday and this morning Leif went out and collected for us. ...and added a variety of other spices. As we did with the Birch syrup, we cooked this down to release the flavors from the herbs, strained it, then added the molasses and sugar to make a thick, sweet syrup. The littlest kids in our group did the harvesting, slicing, washing and measuring for our Cucumber Basil Mint syrup. We taste tested this when it was done and we all agree that it's amazing! Other tasks of our day were to undo some Ugandan Sack Gardens our 7th graders built in the spring and build a new bed for the strawberries to be transplanted into. Miss Mollie, our fabulous garden volunteer, worked with students in the heat to lift, dig, carry and rake. They worked hard, sweated a bunch and saved a whole bunch of little strawberry plants from near-death. Students also scrubbed potatoes that they harvested, shucked corn and prepared some awesome potato wedges for us to snack on. For our end of class taste test today we enjoyed herb-roasted potato wedges and birch tea. Here's Gadiel and London presenting their herb-roasted potatoes. Thank you, Earth, for providing such amazing things for us to eat and Thank you, Friends, for preparing this feast! I can keep an open mind and try new things to eat and drink. Soda taste test day is AWESOME! 3 different syrups, ice and seltzer wate...YUM! Day 5: Today we learned about ways plants can be used medicinally and prepared a feast to share with our family and friends. I can learn about how plants can be used as medicine. Last week I collected calendula and lavender flowers from my home garden. We dried them in the dehydrator, then added them to some sweet almond oil. This oil has been sitting and absorbing the healing qualities of the herbs for almost two weeks now. Today, we used this infused oil to make a healing salve to use on our skin for minor cuts, scrapes and irritations. The students enjoyed watching the process of the solid beeswax melting to a liquid, then adding the infused oil and a drop or two of tea tree oil. We poured the concoction into these small jars and watched it change form AGAIN into a solid. Wow! Here's Winslow preparing some caramelized onions for on top of our pizzas. And here we are, once again, feasting together in celebration of friends, family and the abundance of amazing food. Thank you to everyone who joined us tonight to participate in our meal. FEAST- for delivering farm-fresh produce to us on a weekly basis. 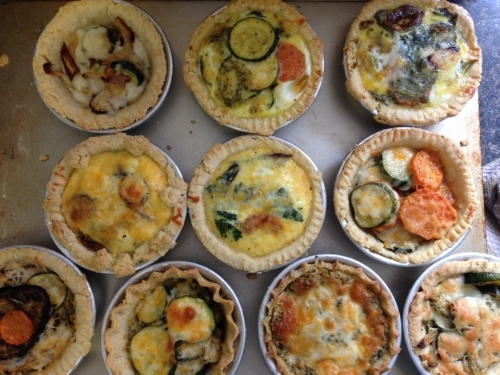 The French Broad Food Coop- for donating cheese and pizza sauce for our weekly feasts. This week begins Evergreen Summer Adventures Camp and the first Field to Feast session: Roots and Shoots- An exploration of how different plant parts are used for crafts, food and medicine. Day 1: Today we oriented ourselves to the kitchen and garden classroom spaces. I can plant seeds and observe how they grow. We planted bean seeds in our new raised bed and began a seed sprouting experiment. We wonder...will the raised bed protect the baby bean seedlings from the hungry groundhog and bunnies? This is our FOURTH planting of beans this season. We are determined! We will watch and see. This is our bean sprouting experiment. We will closely observe how seeds sprout and record the what we discover in our journal, day by day. I can harvest, prepare and eat food from the garden. We harvested cucumbers, sliced them up and conducted a cucumber taste test. How do you like your cucumbers best? Peeled without salt? Peeled with salt? Unpeeled without salt? Unpeeled with salt? We wrapped things up by enjoying our cucumber snack and singing The Garden Song. Day 2: Today we had a guest teacher join us in the science lab for a plant anatomy lesson. I can use the tools of science to learn more about plants and how they grow. Next, we explored the concepts of xylem and phloem with our bodies. Then, we cut, shredded, and dissected to learn more about xylem and phloem in plants from our garden. In the garden, we worked together to prepare beds, transplant starts, harvest and collect measurements for the building of two straw bale raised beds, which we will do later this week. I can work together with my community to grow and harvest food. Preparing beds in the hoop house for tomatoes and peppers. Some aren't! It's the tiniest potato EVER! I can work together with others to design and build a raised garden bed out of straw bales. Today was day 1 of this project. We worked together to measure the space where we will build the beds. We measured the size of a bale of straw and used math to determine how many total bales of straw we'll need for the project. 18! Day 3: We began today with a study of the six plant parts. Then, we began our dye making project. I can make natural dyes from plants. Students cut, peeled and trimmed to make our dye baths. We'll add water and boil the materials to see what colors they produce. Micah and Rowan thought it would be a good idea to chop onions wearing goggles so their eyes didn't get watery. We learned that although it looks cool, it doesn't really work. We still had some watery eyes around the cooking table. Learning how to crush garlic cloves to make it easier to peel the skin off. 11 happy members of the Clean Plate Club. Yummy! and Delicious! We spent the rest of class shoveling soil to mound our potatoes and peeling the outer layers of skin off of our newly harvested garlic. Tomorrow is all day garden day: straw bale raised beds, more potato mounding, garlic braiding and tomato sucker trimming. Day 4: Today we worked hard and sweated a whole lot. Our big project was to build a raised bed out of straw bales. First, we had to figure out how to move the straw bales from the truck to the garden. We figured out that rolling them worked really well. Then, we put the bales in place and started filling the inside with soil. This is the part where we sweat a whole lot. Never underestimate the capacity for a small group of seemingly small children to get a WHOLE lot done! What will we grow in it? One happy teacher and whole bunch of proud kids! Our other fun project of the day was peeling and braiding our harvested garlic to ready it for drying. Peeling the garlic is a very satisfying chore. Isn't it beautiful all hung up in our outdoor kitchen classroom? I can harvest, prepare and eat delicious and healthy foods from our garden. Today is our first Friday Feast day. We put ourselves to work preparing toppings for our pizzas and cleaning and slices the vegies we harvested from the garden. Stevie and Moe learned how to saute onions and cook them until they caramelized. Chopping potatoes and onions harvested earlier this morning. This crew of washed and sliced carrots and cucumbers and prepared a lovely yogurt dill dipping sauce with fresh herbs. And, finally, it's feasting time! A few students prepared our menu board and made sure the tables were set and looking pretty for our meal while Cat got the coals going in the pizza oven. An awesome meal, prepared by all and shared with family and friends. Micah explains to Dr. Susan how to make a pizza. Thank you to our food sponsors this week: For seed & soil contributions, ASAP, Sow True Seeds and Fifth Season. For food contributions, FEAST, Trader Joe's and French Broad Food Coop. 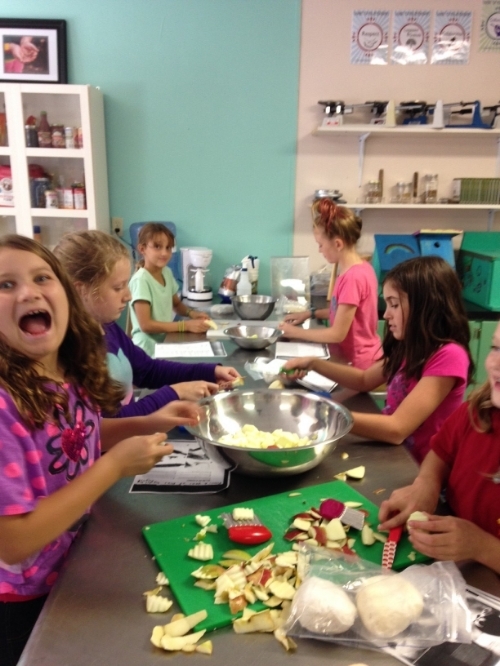 You help make healthy cooking and eating in the schools possible. We appreciate you! 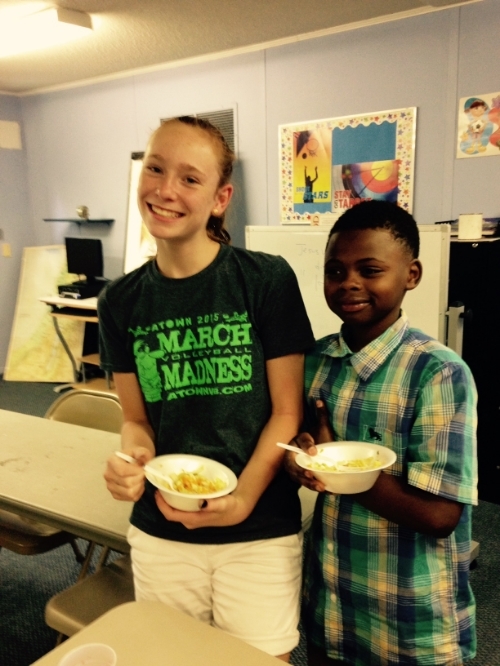 7th grade students explored issues around food production in the United States. How has it changed over time? How does our current industrialized food chain affect our relationship with the food we eat and the farmers who grow it? Students presented on the ideas discovered in these articles and created an image to present to their classmates that summarized the ideas. Students then explored ways that 8 common foods were used in various countries around the world. Students layered this new investigation onto an ongoing exploration of the economics and culture of an assigned country. Students then submitted recipes that used their assigned food. Many students were also able to help plant their assigned food in our school garden. We sifted through the recipes to find the most intriguing and make-able recipes for our Earth Day celebration. On Earth Day, 15 student worked together to prepare these dishes and present a "Global Foods Tasting Table" as part of our Earth Day Community Picnic.